One Pot: Low-fuss food for busy people was a birthday gift to myself, because AWW cookbooks are good, and one pot recipes in the colder months are the best invention ever. Scott wanted to make a bourguignon recipe, and I remembered that this book had one with lamb shanks, so we went with that. It was amazing. The instructions were clear, the dish so incredibly tasty that we didn’t want to stop eating it, and it was really photogenic too (see below). The dessert was less successful. 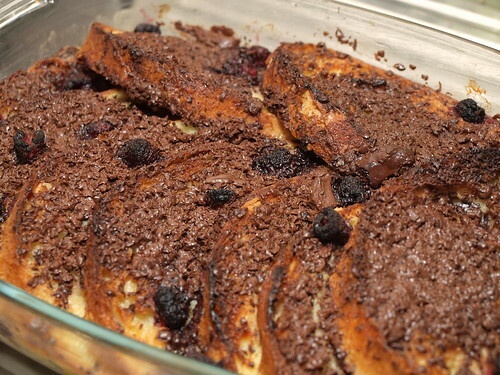 I thought a raspberry and chocolate bread and butter pudding would be good – the results were less than stellar. Clearly the photo in the book is taken before the dish is put into the oven, because the raspberries carbonised, even though the oven was at a low temperature. The pudding tasted nice, but it wasn’t as good as some other bread and butter puddings I have made. Overall I’d give his book 4 out of 5 stars. I’d’ve ranked it higher if the dessert worked. Melt butter in same dish; cook onions, bacon, mushrooms and garlic, stirring, until vegetables are browned lightly. Return lamb to dish with wine, stock, the water, paste, bay leaves and sugar. Bring to the boil. Cover dish; transfer to oven. Cook 1 1/2 hours. Uncover; cook about 30 minutes or until lamb is tender and sauce thickens slightly. Divide lamb among serving bowls; drizzle with sauce. Served with mashed potato. 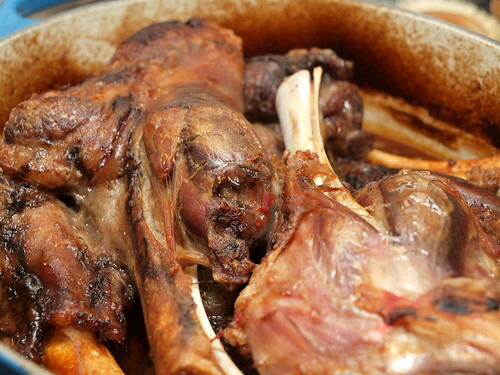 I’ve finally figured out how to french-trim lambshanks – go me. This recipe was so incredibly good, I didn’t want to stop eating it, we ended up freezing all the left overs so we could have them again, because it was so amazing. Preheat oven to 180C/160C fan-forced. Grease shallow 2-litre (8 cup) ovenproof dish. Butter one side of each brioche slice; spread unbuttered slide with jam, sprinkle with chocolate. Whisk eggs, sugar and milk in a large jug; pour over brioche, sprinkle with raspberries and any remaining chocolate. Place dish in large baking dish; add enough boiling water to come halfway up side of dish. Bake about 55 minutes or until pudding sets. Remove pudding from baking dish; stand 5 minutes before serving. It was ok, it wasn’t great. If I made this again I’d bury the frozen raspberries under the bread so they don’t carbonise. That is very sad, they are one of my favourite cuts of lamb (you might have noticed).